I believe that Rolex produces one of the finest watches of the genre. They use well tried and tested in-house movements, encased in an impenetrable housing which are capable of extreme accuracy in extreme conditions. Indeed, Rolex comment that their watches can take whatever your arm can take. You only need look to some of the testimonials of Rolex owners to see the truth in this statement. For example the speed boat racer who crashed at 200 kph and in doing so received 10 broken ribs and a punctured lung. His watch, a Rolex Submariner never faltered. Or, on a slightly less spectacular scale, the Sea-Dweller that was attached to the wears arm and was hit by a passing Mercedes car. The only damage a ‘smile’ embedded by the bezel in the cars wing mirror! However, as is the way with opinions, not every one agrees. The topic is discussed, argued and hotly debated by many watch enthusiasts. Yet on one thing I believe that all watch enthusiasts will agree is the success of Rolex marketing. You only need to walk past you local retailer to see unique and distinctive watch displays used by Rolex. These are no cheap and cheerful creations. Modern day displays are made with brass, suede, silk and other high quality materials and are constructed with meticulous eye to detail. In addition each display is, I understand, insured for over £1,000! But Rolex marketing neither starts or stops with these displays. You only need to look at many of the leading sporting events in the world, such as Wimbledon Lawn Tennis Championships and PGA Golf tournaments to name but two, to see the Rolex trademark ‘Crown’ proudly placed for all to see. Rolex have always been proud of their achievements and producing the worlds first waterproof watch must certainly list up their with one of their greatest. It was this creation that prompted Rolex to produce one of their most memorable displays; the ‘fishbowl’. This display consisted of a glass fish bowl containing living plants, goldfish and, displayed within, a Rolex Oyster. Therefore, on 21st October 1927, she decided to do it again. It was this vindication swim that Rolex seized upon to market their ‘Oyster’ watch. They had arranged to supply a watch to Miss Gleitze hoping that on her successful completion she would supply an endorsement for the watch. 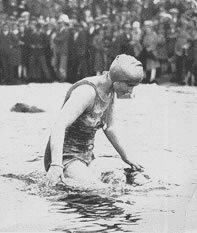 She duly completed the swim and wrote to the Rolex Watch Company saying that not only had the watch remained waterproof throughout the swim but it had also kept perfect time. With this recommendation Rolex reserved the front page of the Daily Express newspaper, at a cost of £1600, and advertised their watch as being "... the wonder watch which defies the elements". As Mr Wilsdorf has since commented: " ... it was the first triumphant rise to fame of the ‘Rolex Oyster’." The actual watch worn by Miss Gleitze, a precision model, was recently put up for auction in London by her descendants. The watch inscribed ‘Miss M. Gleitze, The Companion Oyster, VINDICATION CHANNEL SWIM, October 21st 1927’ sold for over £17,000. 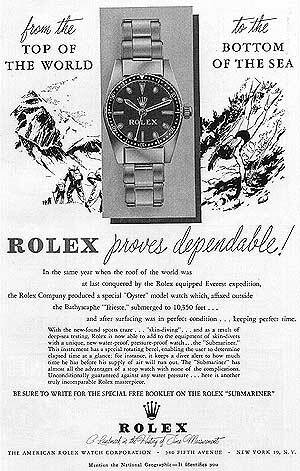 Another interesting, but less well known event in Rolex marketing history occurred on 29th July 1951, the 25th anniversary of the waterproof watch. During celebrations to mark this date, and also Mr Wilsdorf’s 70th birthday, 6 Oyster perpetual watches were attached to a board and in turn, via a rope, to a boat. These watch were subsequently towed, submerged, behind the boat for the whole day. As history recounts the watches were set, but not wound. At the end of the day the watches were removed from the water and found to be functioning perfectly and also telling the correct time. "Watch worked perfectly at 10,335ft, congratulations Piccard"
However, this technical achievement was not made overnight. The first prototypes of this watch were produced with meticulous care. The cases were turned by hand, a special glass was created and a new winding crown was cut and fitted. These prototypes were then tested, but after a short time they filled with water. Some adjustments were then made to a second batch of test watches and these were subjected to a pressure of 6000 lbs per square inch. This batch of watches lasted longer under the test conditions, but still after a few hours both failed. The first watch filled with water, the second watch ‘caved-in’ on itself. When the second watch was dismantled, the hands and the luminous paint were found embedded in the watch crystal and the inside of the case back showed the deep impressions of screw heads from the 10½ ligne movement. Not being daunted the Rolex technicians constructed another batch of test watches and were lent a new type of pressure chamber that would show immediately if any of the cases failed the tests. With this chamber and yet more refinements to the cases and glass, Rolex were able to test a prototype watch case that was capable of withstanding 9000 lbs of pressure, but it still had one weakness. Although the watch could withstand the pressure, it could only do so for about 3 hours - not long enough for a descent and ascent in the open seas. The Rolex technicians studied and examined their attempts up to this point and finally made some small changes to the crown and staff. This last improvement finally won the battle and when the prototypes were tested for the full length of time, not one bead of moisture was found in the case. Yet this initial depth record was to be broken 7 years later.
" ... this means that the Rolex Oyster has been to the highest, in reference to the Explorer equipped Everest expedition of 1953, and lowest points of the world surface." One of these Deep Sea Specials , there are believed to be only 7 ever made, recently went to auction in London and the most striking thing about this watch, besides of course its dimensions and weight, was the attached bracelet. One might expect a bracelet as substantial and monolithic as the watch it self to be used. But instead there was a Stainless Steel and Gold expanding rivet bracelet attached. Although I cannot confirm that this was the original bracelet, it seems a surprising choice of band. Mainly due to the fact that when it is fastened to the wrist and the arm is turned over the watch drops to the full length of expansion. The watch was finally sold for over £75,000.